We proudly carry WahMaker clothing. 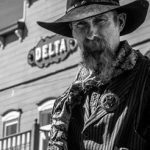 Living history and old west reenactors have long known that WahMaker stands for authentic styling and unequaled dependability, and we're proud to be one of WahMaker's top online dealers. Click here to browse our full line of WahMaker products. If you want a Wahmaker item that you don't see in our Old West Store, please contact us for a WahMaker special order! Click here to visit our Ladies' Wahmaker Department. Loved the black Cordelia pioneer dress, quality workmanship. Will order one in another color soon. Can't wait to dress up for a volunteer event! The product was exactly as seen on the website. Good quality, too. The website is very easy to use, even with all the choices. Very quick delivery. I was delighted with the product, price and service received. Only took 3 days to get from San Francisco to the Customs House at Heathrow Airport, UK. As usual, postal service from there is appalling but the product worth waiting for.